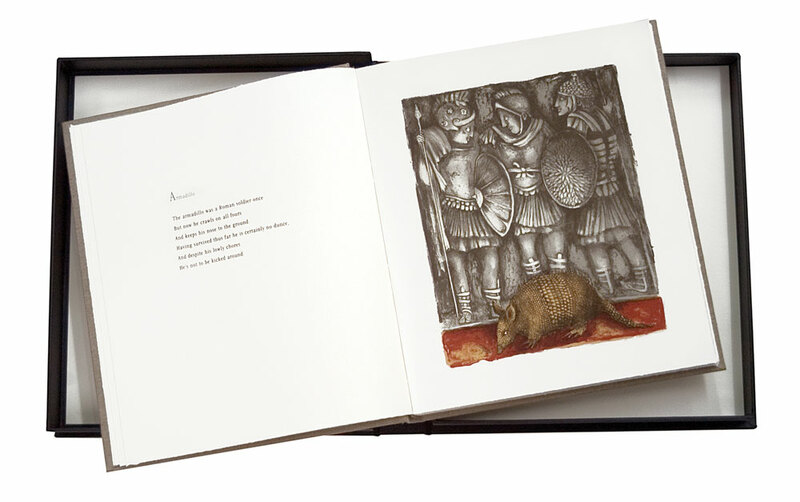 Artist’s Book with twenty original screenprints by Ana Maria Pacheco and forty poems by George Szirtes. Printed on Somerset Book soft white 175gsm in an edition of 55. Text set in Garamond Light Condensed. Page: 30.5 x 26 cm (12 x 10 1/4 in). Full linen case binding in a drop back box. This Artist’s Book was part-funded by an award from Norwich School of Art and Design. Annela Twitchin, from ‘New and Recent Prints’ in Collected Essays: Texts on the work of Ana Maria Pacheco, Pratt Contemporary Art, 2004. ISBN 0 9518049 8 7. The twenty original screenprints in the book are available in separate editions of 25.